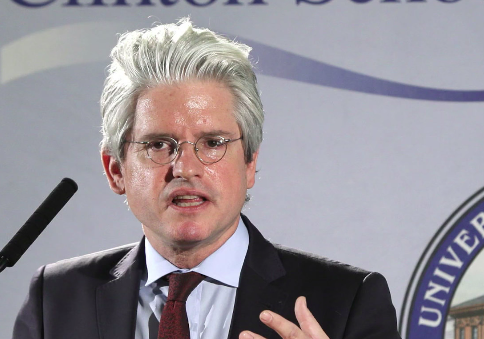 The head researcher at David Brock's multimillion-dollar opposition research shop is convinced by the Twitter-born conspiracy that Nazis at the Trump administration's Department of Homeland Security use numerical code to transmit white supremacist messages through its press releases. Pat Dennis is research director for American Bridge 21st Century's anti-Trump war room. The 47-person war room he leads, according to confidential documents obtained by the Washington Free Beacon last year, was bolstered by a $7.8 million budget in 2017. Dennis's interest in the conspiracy was piqued almost immediately after Twitter user Laurie Voss initially pointed out last Thursday that a DHS press release from February was filled with what Voss saw as Nazi code. Voss argued the release had both a 14-word headline and 14 bullet points (it actually has 13 bullet points), important because 14 is the number of words in "a famous white supremacist slogan" that, just like the DHS headline, starts with "we must secure." Voss also noted the use in a statistic of the number 88, "a Nazi dog whistle for Heil Hitler." "There is absolutely no doubt now that this article is intentionally a signal to Nazis," Voss concluded. Dennis, just 40 minutes after the initial tweet, announced he would be filing a FOIA on the controversy. Dennis followed up Voss's announcement by saying the use of the number 88 "clinches it" for him, saying it "flipped him from ‘wow that's weird' to ‘we're doing work on this now.'" Dennis did not respond to inquiries into how serious he is about the Nazi code theory or what exactly he asked for in his FOIA. A spokesman for American Bridge didn't respond to a request for comment on Dennis's interest in the theory. DHS wouldn't comment on whether Dennis or anybody at American Bridge had filed a FOIA request, but it has written off the conspiracy and anyone who entertains it. "This is a Twitter troll conspiracy theory that on its face is beneath any credible media outlet," a spokesman told Buzzfeed. Most who took a serious look at whether or not DHS has been infiltrated by Nazi code talkers have written off the conspiracy. Some pointed out the phrase "we must secure" is a quite common one when referencing the border and others noted that there are actually 13 bullet points, not 14 as Voss claimed. MSNBC's Chris Hayes additionally explained the "random use of 88" by DHS actually made sense, and was based on a related immigration statistic. American Bridge deems itself as "the political research engine of the opposition" and has been embraced by the Democratic Party. The group brags that it has "became the heart of the party's research and communication's infrastructure." It has in the past been revealed to be behind opposition research used by mainstream outlets such as the New York Times to attack Republican candidates. UPDATE 4:57 p.m.: After publication of this story, Dennis reached out to provide the following statement, an apparent attempt at a joke referencing President Trump's comments following protests in Charlottesville, Virginia. "There is an argument over to what extent the ideology of white supremacy has permeated the Trump administration, and there are some very fine people on both sides of that argument," Dennis said. "I think there’s blame on both sides." This entry was posted in Politics and tagged David Brock, DHS, Trump Administration. Bookmark the permalink.